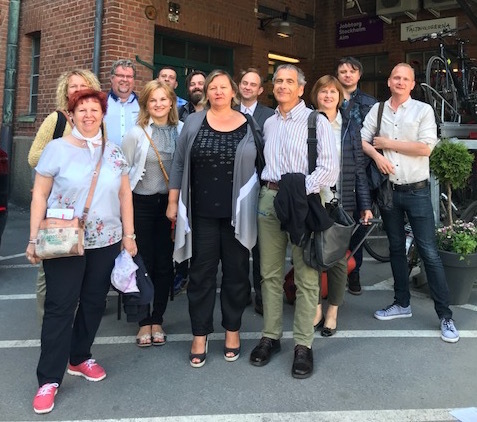 On 18 and 19 June 2018, the EFEE Peer Learning Visit (PLV) to Sweden took place in Stockhom on ‘Promoting social inclusion by fostering integration of newly arrived migrants and (re)engaging NEETs in education, training and jobs’. The event was hosted and co-organised by the Swedish Association of Local Authorities and Regions (SALAR). In total 10 EFEE members and representatives participated in the PLV from Belgium, Montenegro, Malta, Romania and Slovenia. On the first day, participants were invited to join the conference on “School to Work” organised by SALAR in its premises in Stockholm. Goal of the conference was to present the work of the Flagship initiative School to Work (S2W) in the Baltic Sea Region, to promote networking and to stimulate peer learning. The conference gathered 62 participants (of which the 10 mentioned EFEE representatives) from schools, civil society organizations, municipalities, public employment services, welfare institutions, businesses, academia, and government institutions (regional and national). During the morning session speakers from SALAR and members of S2W (including the Helsinki Deaconess Centre, Nordic Welfare Centre, Norden Association in Sweden, and Municipality of Turku (FI)) informed the participants on the activities and results of the Flagship initiative. The Flagship initiative is coordinated by SALAR and aims to supports collaboration in the Baltic Sea Region to prevent early school leaving and to develop support measures for young people who are neither in education, nor employment or training (NEETs). The afternoon session focused on sharing good practices and fostering peer learning among the participants. Participants had the opportunity to join workshops on the following four themes: Faster Tracks to Education and Labour Market; Effective Mentoring at Schools and by Peers; Attractiveness and Equity in Vocational Education and Training (VET; and Supportive Actions for Young People to Come Back to School or Begin to Work. The next session dealt with “Methods for cooperation across borders”, during which various methods were presented which could be applied when trying to bring in new initiatives and methods from abroad, including: peer development, co-creation, study visits, and defining the added value of transnational activities. The conference was concluded with an interactive panel session featuring a speaker of EFEE (represented by Koenraad Vandenbussche of GO! Education of the Flemish Community), a representative of SALAR and a pupil with a refugee background. They shared examples of what employers in education and local and regional authorities could do to support vulnerable kids in our societies, including newly arrived migrants and refugees. The second day of the event consisted of a Peer Learning Visit organised by SALAR and EFEE to learn more from the Swedish solutions in the fields of education & training and labour market incentives, that prevent early school leaving (with main focus on secondary education level), rehabilitate young people, promote integration, and increase employability of young people in order for them to become socially and economically active and responsible citizens. The morning part focused on vocational education and training and apprenticeship opportunities for youngsters. It was concluded that in order to support all youngsters, and in particular the most vulnerable group, individual and tailor-made learning pathways are necessary that respond to the diverse needs of the students. A representative of the Swedish National Agency for Education provided further information on The Apprenticeship Center promoting work-based learning pathways in the Swedish VET System. This autumn a pilot programme will start in Sweden in which apprentices will be employed and will receive a salary. Herewith the Swedish National Agency for Education hopes to make the VET system more attractive. Furthermore one will be working on streamlining between VET and Higher Education systems, to make sure that VET is not seen as a ‘dead end’, but as an alternative route, explained the representative of SALAR working on VET. Regarding the VET opportunities for newly arrives migrants, it was noted that companies are working together with VET schools to offer introductory programmes that, when successfully concluded, offer access to the regular VET programme (at initial VET level). Furthermore for adult education level it was mentioned that one is now looking into the possibilities to learn the language during practical VET training (also at the workplace) instead of the requirement to have completed the language course first. The second part of the day started with a trip to the youth organisation AIM (supported by the City of Stockholm). AIM reaches out and provides supportive services for early school leavers in upper secondary school (age 16 to 20) in order to ease their way back to school. Furthermore it was explained that officers of AIM work closely together with social services, the medical department, and education department to fulfill the personal goals of the youngsters. It is the goal of AIM to give each youngster a future by exploring alternative pathways to reach his/her fullest potential. Consequently, the participants traveled further to Blackebergs gymnasium, a secondary school in the outskirts of Stockholm. At the school, participants met with the principal and teachers who showed them around and provided further information on the special support summer courses that are offered by the school, including language courses for Swedish as second language for children with migrant backgrounds, but also courses in Mathematics and English (in order to access upper secondary education, pupils need to have passed the exams for at least these three subjects). In total 1200 students attend the summer courses from all over Stockholm (participation is free of charge and include lunch). Courses are offered for four weeks everyday from 9.00 to 14.30, but the courses also include social activities to stimulate interaction, and to get to know the culture and country. If necessary, children also get mental support by a psychologist working at the school. The Peer Learning Visit made clear that in the different parts of the EU we are facing the same challenges to reach out to the most vulnerable groups in our societies by (re)engaging them in education, training and jobs and to prevent his way that they become excluded from the society. Quality vocational education and training that offers individual learning pathways that answers to specific needs of the diverse group of learners plays herewith a pivotal role. Furthermore the Peer Learning Visit offered an excellent opportunity for EFEE and its members to get further insight in good practices of Sweden and transnational activities taken in the Baltic Sea Region in the areas of fostering integration of newly arrived migrants and (re)engaging NEETs in education, training and jobs, to network with members of the S2W Flagship, and to explore possible synergies between EFEE initiatives and the Flagship activities.